My cats are pretty good mousers which I normally think is excellent, today not so much. I knew he had one cornered and he normally eats them. What made today different is he had in fact just eaten breakfast so wasn’t super hungry. I heard quite a bit of ruckus coming from the kitchen followed by the patter of feet’s running towards the living room. Now if I was more awake I would have realized what was coming I however just sat here like a statue. Snugs (the cat) in an effort not to loose his prize was making a b-line for the living room. Our living room is fenced off for the baby so the dogs don’t run her over. Snuggle pants saw this as an ideal place to play with his very much undead mouse. The cat made it over the fence and I was able to wake up enough before olive our Aussie came flying over the fence after him. Well I thought phew crisis averted until I turned around and to my horror my kid was headed straight for the rodent. I made a dive for the mouse at the same time as my kid. The cat seeing his life flash before his eyes disappeared behind the couch. I am sure that as I snatched that mouse off the floor just moments before my dear sweet child it was relieved thinking it might just be saved. Not so poor creature. This mouse must have had a opossum as a distant cousin because he was quite clearly not as bad off as he made out to be. As soon as I had him he came quite alive which scared the living daylights out of me resulting in me flinging the creature into the dining room. As I saw the mouse flying through the air I realized the it was headed straight for olive. Like a champ this is the one time she catches something that I throw instead of it so gracefully and ladylike having it bounce off her face. Well no amount of me saying leave it or drop it would have saved that critter. As olive puts it possession is 9/10 of the law so she caught it’s hers making her only 10% naughty. Down the hatch that mouse was gone and I’m sure Snugglepants is still behind the couch planning his revenge. Well we are still here, perhaps a bit chilly but we are here. Our farm has been covered in a deep blanket… I mean smothered by a layer of snow. Normally I am all for branches covered in a liberty layer of white and a clean fresh snow to make fresh footprints in however not now. My chickens have chosen to stay in their coop for three weeks now meaning I also haven’t had any farm fresh eggs either. The horses and sheep have also preferred to stay in their shelters as well. Henley and I have been hiding in our house as well as it’s really just to cold to do anything outside. Cabin fever has reached a critical level here at the farm and I’m sure my husband is wondering how we will possibly wear all the things I’m knitting up. I hope all of you are stay safe warm and dry as well! I had a request for the chili verde recipe so here it is, please note I did can mine but this is not a proven recipe. I tend to like my food to be a bit spicy so feel free to half the spices taste and add more as needed. Cook onions and garlic until onions are translucent, add tomatoes and salsa verde. Stir well then add the green chilies and enchilada sauce. Once combined add spices and stir well then add shredded chicken. Simmer for 30 minutes serve garnished with cilantro and lime. This can be served over rice or eaten with a bit of cheese and tortilla chips. I used a rotisserie chicken in this recipe and it was still delicious. I also bought the small cans of green chilies and they tasted fine in the recipe (I believe Walmart sells the 1 pound cans). Fall is quickly taking hold with the trees shedding their leaves and frost on the ground when I wake up. We put up more permanent fencing on the hill for the sheep to winter on. The waters in the pastures this morning had a nice layer of ice on top that I broke apart for the animals. I realized that I have been feverishly knitting christmas gifts but don’t have a pair of mittens for myself. I worked Gus today on the sheep he was good but Purdy wasn’t impressed with either of us. When I was moving the chicken fence down the hill a bit Purdy had this look on her face that clearly said “that’s my hill your giving the chickens you will regret this choice.” Shortly after the Purdy snuck up behind Gus and snorted on him which startled him. I was pretty sure I could hear Purdy laughing at us. As you all know the first day of fall happened recently. For me this is a not so gentle reminder of the ginormous list of things left to do before winter. My amazing husband Jeff has a full time job outside the farm (required to support my wool habbit) so I try to get as much done alone as possible. This past week I decided it was time to move the sheep closer to the house up on the hill. I chose to do this for many reason but they all mostly add up to making winter life easier. I am hoping that Purdy and the sheep living closer to the house will make them a bit less skittish. I might be able to make friends with the crazy llama. Purdy did resist the initial moving plan as Jeff has mostly been the one feeding her in the morning which makes me less familiar face to her. I ultimately chose to leave Purdy behind to move last as she was not on board with my plan (and fight ing with Purdy is not my favorite sport). Lately Gus hasn’t been super reliable working as he has been getting a lot of ideas of his own how things should be done (we’re working through it). I chose to not take Gus down as I thought my sheep were well enough bucket trained and we would be going through not well fenced pasture … boy did I misjudge that choice! I had my bucket of grain, my aunt was gracious enough to come and help watch Hen during all this. That turned into why don’t you just wear Henley and you can help (two are better than one right!). So I opened the gait shook my grain bucket and they all stared at me like yeah… we don’t go over there so nope. Purl being the only sheep I can count on to run me over for grain came over and was grateful for the snack until I put a halter and lead on her and handed her to Annie. 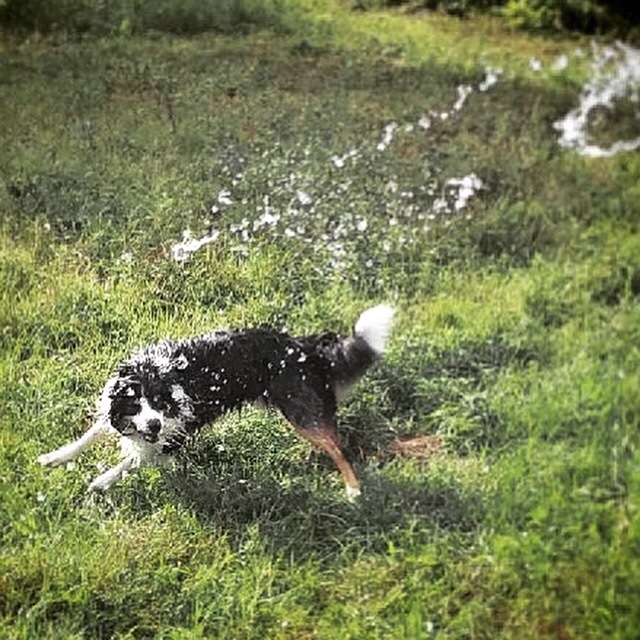 I told Annie to start walking hoping that the rest would follow purl and my bucket of grain… nope. After 30 minutes in the super hot weather for New York in September I almost had them all to the gate I needed them through (I make a great herding dog when needed I just lack a good bite when it’s really needed) when Ewestace decided she was no longer on board and was going back to her pasture … with her friends in tow. It was at this point after quite a bit of colorful language that I went to get Gus. I won’t lie to you I saw all the ways this could go wrong in my head. Gus isn’t super strong at his driving and lately he has been very quick with everything. My big willow girls are in heat and have been extra difficult for the dog which just creates more pressure all the way around. I sat Gus down on the front porch where it was just the two of us and had a pep talk. I told him how naughty Ewestace had been and how I really needed his help and shouldn’t have doubted him in the first place. I told Annie to open the gate when the sheep got there and they could come in a bit quick. 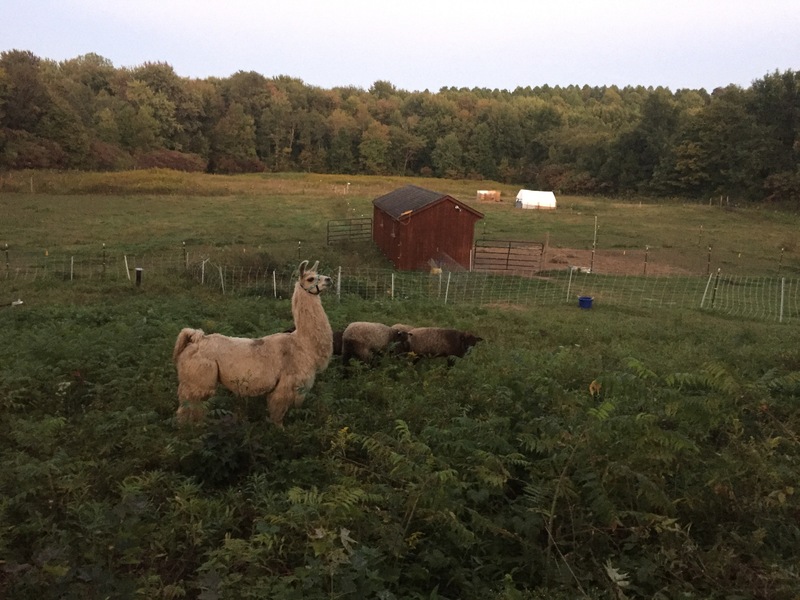 I should add that all this time Purl was oblivious she was all alone and was happy as a clam to be hand grazing with Henley and Annie. Gus and I went all the way down to the middle sheep pasture to get be able to come behind the sheep. Gus made a lot of arguments with me about how driving sheep isn’t exciting and his flowing locks won’t be able to blow in the wind he creates on his bueatiful outruns. I won’t repeat what I said back to him. In the end Gus did everything I asked of him he did it immediately and correctly. It might not have been the most beautiful thing we have done but it took him less than 5 minutes to do what I had been working on for almost an hour. In the end I left Purdy in the middle sheep pasture alone to think about her life choices. She was very dramatic trying to convince me I was making her die a slow painful death. Jeff was able to help me calmly walk her to the hill after he got home with no problems. Gus got many cookies for being such a good boy and saving the day. 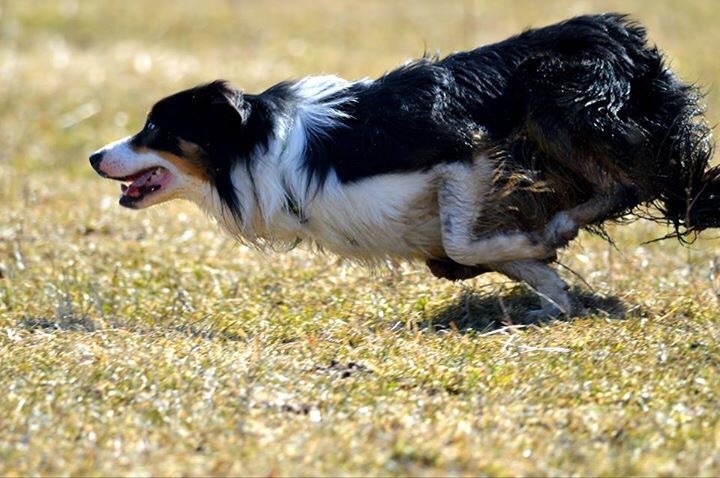 Lessons learned … don’t doubt all the hard work you out into your working dogs. You will always have something that you are working on with them but that doesn’t mean that in the end when it comes down to it they won’t step up and get the job done for you. I thought it might be time to introduce ourselves since we have acquired so many new followers. If you have been following us from the beginning you might have noticed that Cacia Farms has been many things. We started out when I convinced my husband we would raise meat rabbits on our 1/4 acre lot in our small town. Well 30 some odd rabbits, 3 cats, 3 dogs, and a horse later I convinced my husband to move to a farm. Let me first tell you about my husband Jeff he is the most patient, kind and caring person I know. Jeff puts up with all my dreams which are many and the best part is that he truly believes I am capable of achieving every one of them. We have been on our 21 acre farm for a year now and we absolutely love it! Our main focus on the farm is the raising of wool sheep. The breed of sheep we raise are called Lincoln Longwools which are a heritage breed. Lincoln’s are a dual purpose breed that produces a fast growing fleeces that has a wide lock and bold crimp. 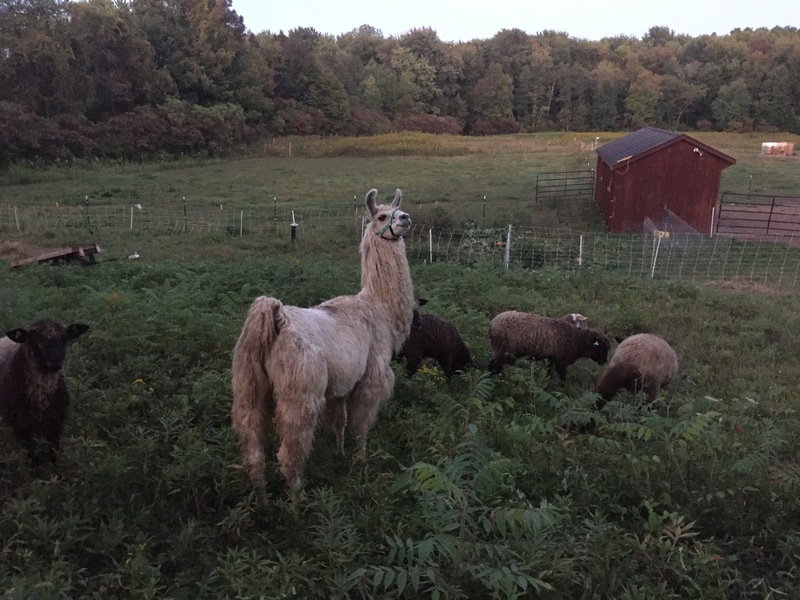 We also have a livestock guardian llama whose job it is to protect the sheep from predators. Fall is upon us here in upstate NY and with that the rush to get everything prepared for winter. The girls will need to be sheared next month along with trimming their feet. This will also mean I will have five more fleeces to take to the fiber mill to be made into yarn. We have made a nice area on the hill to allow the sheep to winter closer to the house to make chores easier in the winter. The new chickens are integrating nicely with the adult hens and everyone is getting along nicely. I am hoping to get in some nice knitting time on my porch while I watch the leaves change this fall.